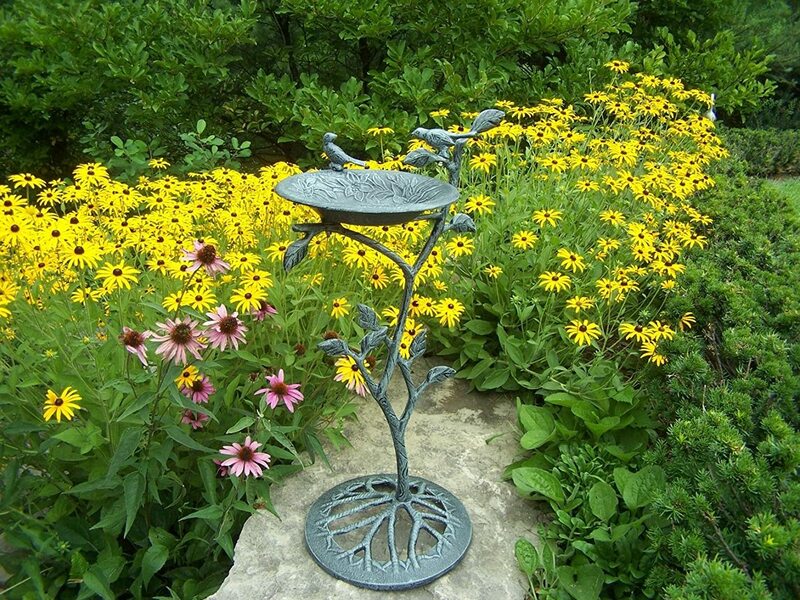 Our bird baths are the perfect edition to any setting. 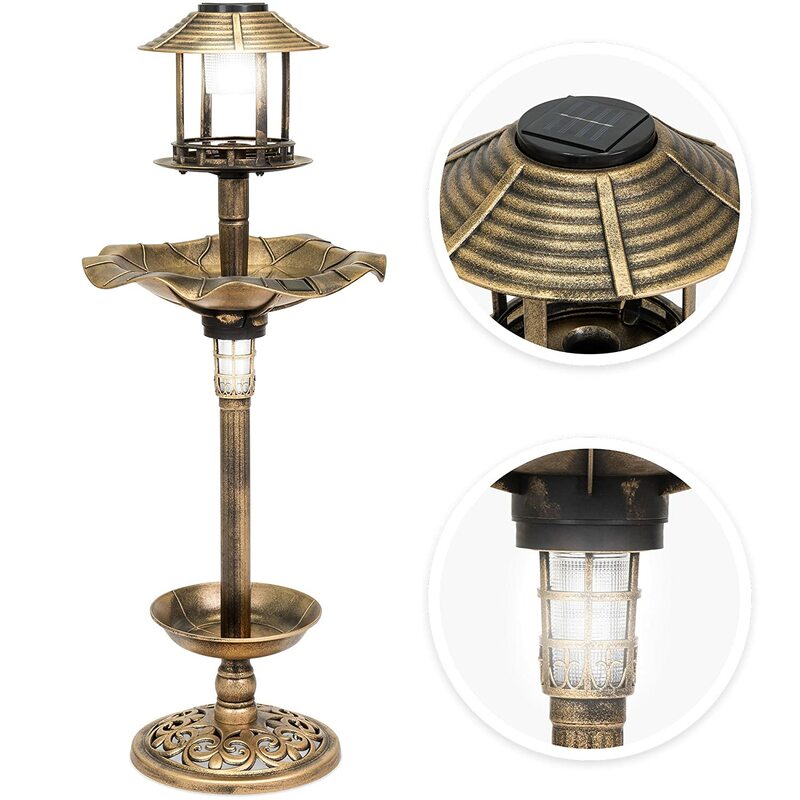 Adds beauty and style to your outdoor patio, back yard, or garden. The bowl is made of rust free cast aluminum and the base is constructed of durable cast iron. Features a hardened powder coat finish for years of beauty. I did end up sending this item back which was a very smooth process! I found for my needs it was not suitable I needed a bowl that would hold at least a gallon of water and useful for many birds at one time. 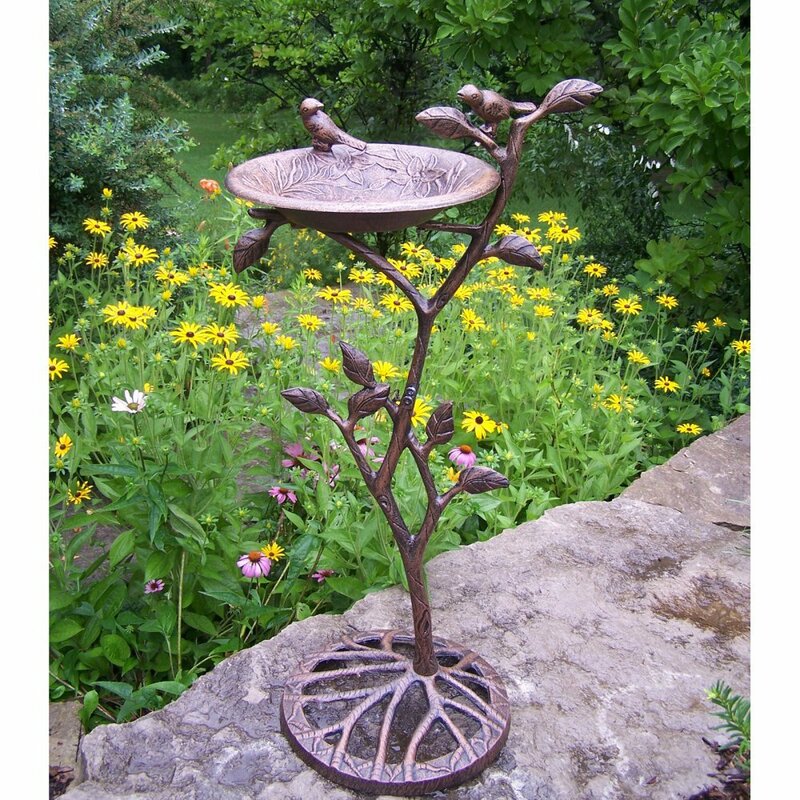 I believe this birdbath would work very well in a very small garden area used more for decoration: it is beautiful. I put the item together all by myself which took a little bit of thinking because the parts are very heavy. 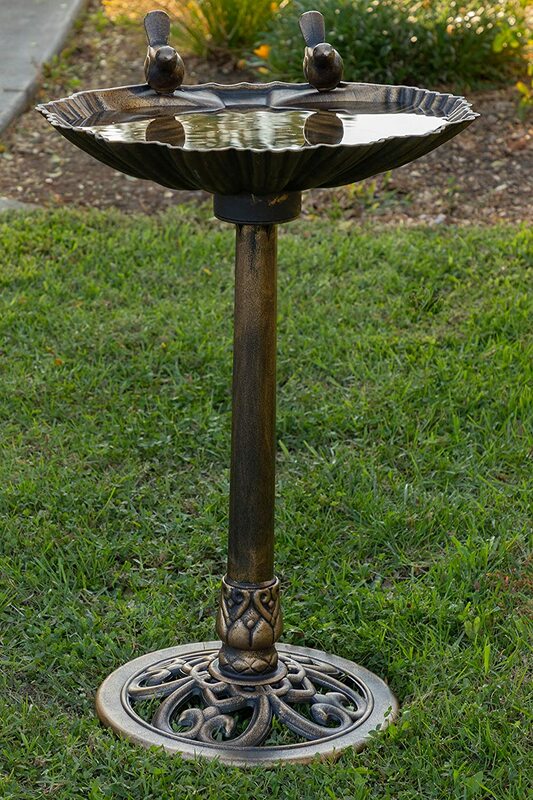 The bowl on the metal does not set level, but that should present no problem if one sets the birdbath on dirt where the setting of the base could level the bowl out. The bowl measures 11 inches across and is deep holding about a half gallon of water and the base is 13 inches. I found the item packaged for shipping done very well and no problem there or with any of the pieces. This should have taken me 5 minutes to put together. However, the pre-cut holes did not fit with the hardware that was included. Even worse, the hardware included for installation would be purposely visible once complete. Who wants to see bolts and nuts in places on a birdbath. I had to buy replacement pieces so at least I could get the thing together. The water bowl is very small. Its a lovely heavy piece otherwise . . . they really screwed this one up buy including awful hardware. I'll be returning it - its certainly not worth the $85 I paid and the additional 2 hours and $ getting to the hardware store. Very frustrating and disappointing. I like the overall look of the metal base, limbs, leaves and bowl with bird figurine. As stated, however, the engineering is faulty. I could only get the water bowl somewhat level by adding a bunch of aluminum washers I cut on the band saw as spacers and also placing the base tilted in a soil filled planter. It is a compromise, but it looks okay to my eye now. First the few positives: nice powder coated Verdi Grey finish, substantial weight, nice looking as a SCULPTURE. Now the cons: terrible instructions, crooked stand (no matter how you turn it on the base), bowl sits at a downward tilt so severe that it barely holds any water. You ask WHY NOT SEND IT BACK ? Too much trouble, I'll keep it as a garden sculpture! 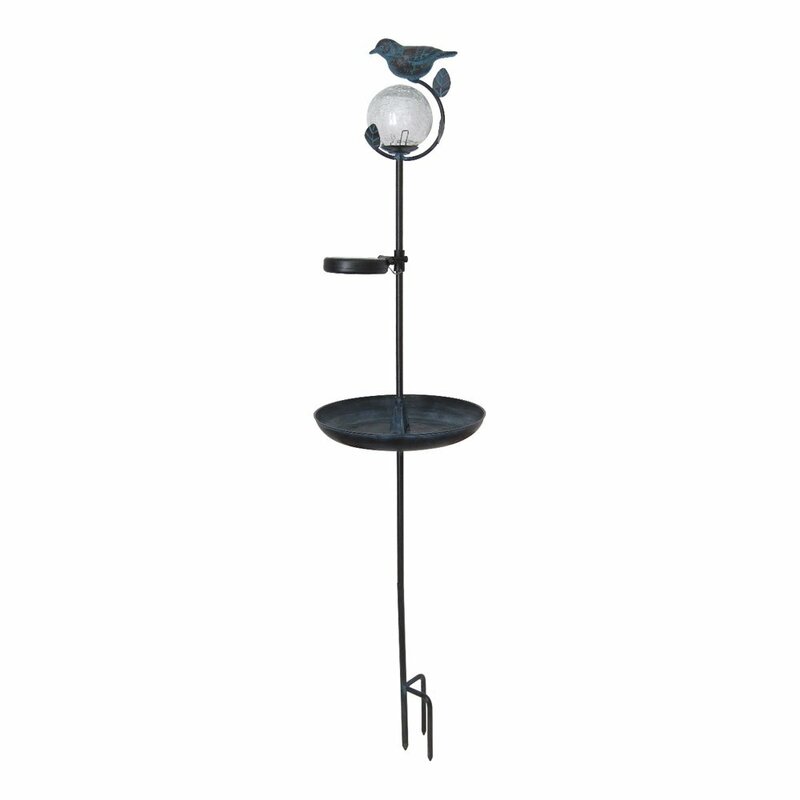 I wanted something small but pretty by the front door and I am very pleased with this bird bath. Just be sure to read the directions before trying to put it together! It's not hard but there is a certain order to putting it together. It's also very solid and the base is heavy but not too heavy that you can't manage it. I was pleasantly surprised how nice it is. My husband had to add some nuts and bolts to get the bowl to be level. It's not very stable so we had to make a bigger base of pebbles to anchor it. It's delicate and fits our landscape plan, but not so easy to put together.